Though it’s also true of life in general (29th birthday is right around the corner), I’m more talking about day-to-day and hour-to-hour time here. Unless you’re on a software training conference call, it seems like the days just zoom by. While I believe it’s a sign of a happy life – full of fun, work and the intersection of the two – it also poses a challenge. How do we fit in everything we love to do? This, of course, includes cooking challenging meals and enjoying delicious food. Achieving this balance requires thinking outside of the box. Our favorite foods, almost by definition, take a long time to prepare. We love making everything from scratch, and find that shortcuts often lead to cutting out taste and quality. If I’m being honest, Rachael Ray’s 30 minute meal empire makes me cringe. Pre-heat oven to 375 degrees. Break asparagus at their natural breaking point. Season with salt and pepper and olive oil. Roast for 15 minutes. This is also delicious on the grill for about 5-7 minutes over medium-high flames. Get 4-5 oranges (and/or grapefruits, blood oranges, etc.). Peel oranges, including outer pith, and slice into rounds. Take half of a fennel bulb and shave off slices as thin as you can get them. Combine with 1 T olive oil, some lemon juice, and a pinch of salt. Season tuna steaks with salt, pepper, cumin and ground chili powder (ancho is preferable, but cayenne or even chipoltle would also do well). Heat 1 T vegetable oil over medium high heat. Sear the tuna for about 1 minute on either side. 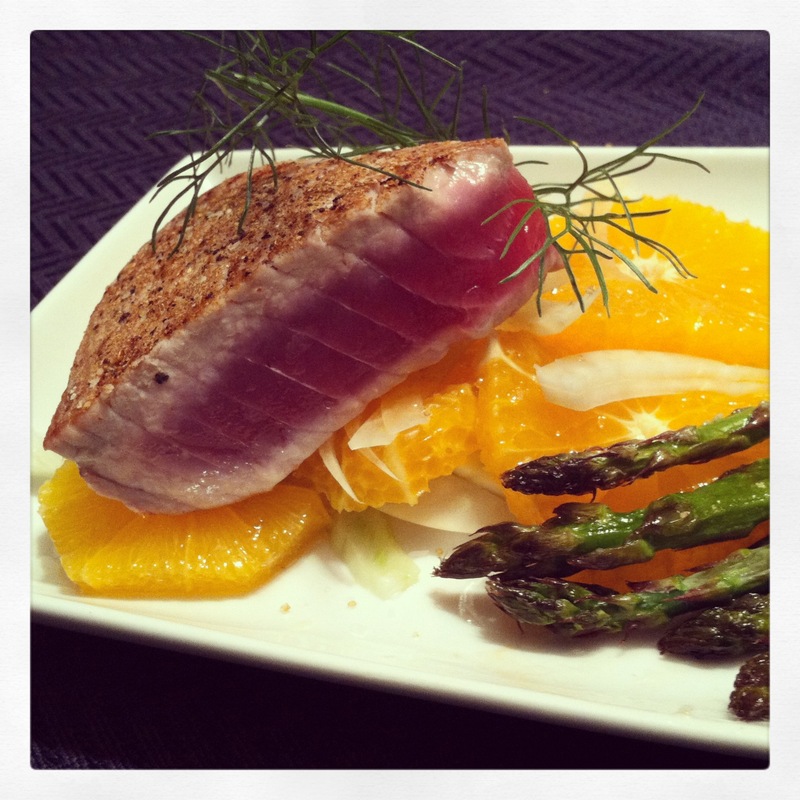 Place tuna over the salad and garnish with fennel fronds or fresh mint. Serve asparagus on the side. If you want to really tie it all together, whip up a citrus vinaigrette for the asparagus. Serve and enjoy! ← 1 Year in our House! What a beautiful meal for the good ol’ summertime! I love the simplicity of the meal and the easy to follow recipes. Thanks so much!